This wine captured my attention with its understated elegance. 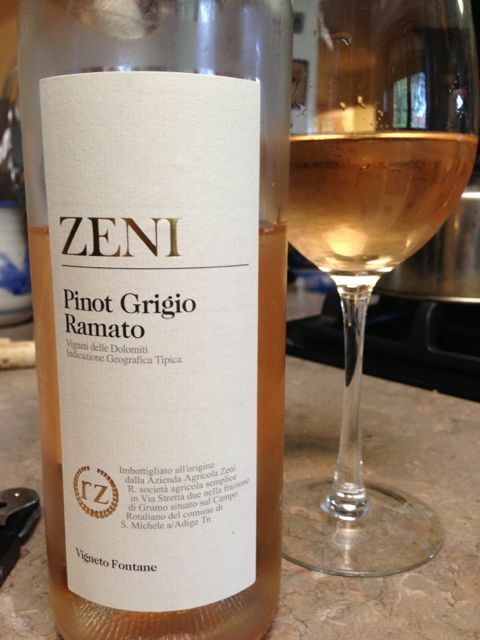 It has an unusual color for a pinot grigio, straw with a hint of pink. As soon as I caught the scent, I thought: Hey now, what’s this? The producer describes it as an aroma of ripe pears. Yes, something like that. It’s very light and fine, yet evokes the musky sexiness of the base note in a perfume. I was strongly reminded of the faint, fir-tree scent at the nape of my husband’s neck. Very nice. The taste is delicate too. Dry, well-structured, but fragile. This works best as an aperitif, with foods that won’t overwhelm it: some mild fresh cheese (I tried mozzarella and it was an excellent match), or a handful of salted cashews. AND you have to let it get to cellar temperature or even room temperature before the flavor and scent fully manifest.